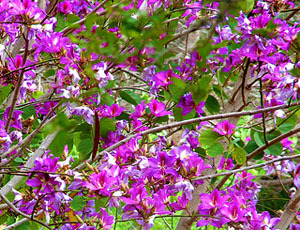 Orchid Tree (Bauhinia), also known as Hong Kong Orchid, Butterfly Tree, or Napoleon's Hat comes in whites, pinks and purples, depending on the species, of which there are approximately 350 trees, shrubs and climbers. This tree grows to 20 to 40 feet and is a favored street tree in Florida and Hawaii. The showy blooms resemble orchids in clusters at the ends of the branches. I have one that was here when I bought this property in central Florida. The blooms are white, but I prefer the more flashy purple. They are easy to propagate from fallen seeds that sprout, and are considered invasive in some places. The leaves are a very interesting double oval shape. This is a beautiful tree when in full bloom, with its wonderful fragrance wafting through the air.